Instant downloads of all 946 LitChart PDFs (including V for Vendetta). 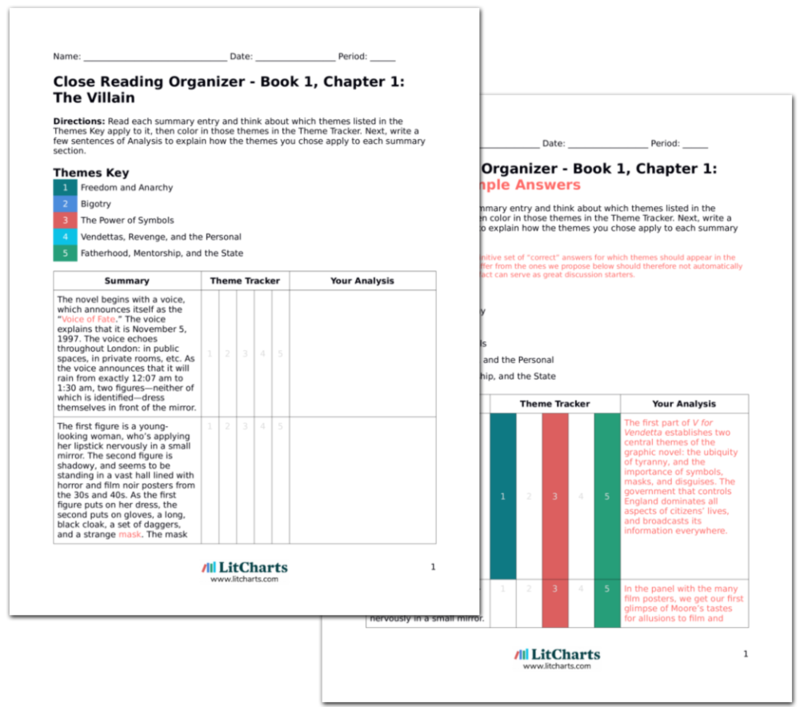 LitCharts assigns a color and icon to each theme in V for Vendetta, which you can use to track the themes throughout the work. It is November 9, 1998. At 9:30 PM, a massive riot has broken out in London. Finch and Dominic stare out at the mob from the safety of their headquarters. Finch notes that the rioters follow the “Symbol of V.” He reminds Dominic that symbols are all-important—the Leader made a crucial mistake in forgetting this fact. At the beginning of this chapter we’re again reminded of the importance of symbols. This observation coincides with Evey’s realization that symbols are more powerful than individual people. Finch turns to go. As he does so, Dominic suggests that drugs have addled Finch’s mind. Finch replies that his mind is perfectly clear. As a young man, Finch admits, he lost his entire family to the war. Afterwards, he believed that he could make the pain of this loss disappear by following orders. Now, he realizes that following orders will never ease his pain. Henceforth, he tells Dominic, he’ll only follow his own orders. He tells Dominic to take care, and leaves. The relationship between Finch and Dominic isn’t entirely adversarial or entirely friendly. They have great respect and trust for one another, but ultimately, it’s Finch, not Dominic, who fully recognizes the corruption of Norsefire. Whether or not Dominic will follow suit and begin thinking for himself remains to be seen. Alistair Harper arrives at the Heyer household. He opens the door and calls to Helen Heyer, whom he’s clearly expecting to be there. No one answers him. Harper walks into a room, where he finds a television playing the footage of his sexual encounter with Helen. As Harper watches, Conrad Heyer attacks him with a wrench, brutally killing him. Before he dies, however, Harper manages to slash Conrad on the neck with his razor. Here, we see the weakness of Norsefire’s bigotry and sexism. Instead of seizing power herself, Helen is forced to work with two intermediaries: Harper and her husband Conrad. These men are weak and violent, and here, they defeat each other instead of working together. Ultimately, Norsefire’s own greatest enemy is itself: its violence, its bigotry, and its ignorance. Shortly after Conrad kills Harper, Helen Heyer comes home. As she enters her home, she hears Harper’s voice—actually coming from the television. She tells Harper—who she thinks is in the house—to go home, since Conrad will be home soon. As she walks into the living room, she finds Harper, lying dead on the ground. Next to Harper, she finds Conrad, bleeding profusely from his neck wound. Conrad begs Helen to take him to a doctor before he dies. Instead, Helen furiously tells Conrad that he’s ruined everything: she’d planned for the three of them—Conrad, Helen, and Harper—to control the new government. Then she tells Conrad that he’s always loved “to watch”—and she turns on a camera, hooking it up to the television, and leaves Conrad to watch his own death on TV. Throughout the graphic novel, we’ve seen the Norsefire officials receive ironic comeuppances. Perhaps the most ironic is Conrad’s. Having spent his entire life watching other people, Conrad is forced to die watching himself bleed out. Helen’s indictment of her husband might as well be an indictment of the entire Norsefire government: it’s obsessed with controlling other people, dominating them by watching, listening, ordering, etc. Here, in the twilight of Norsefire’s power, Helen deals out a punishment V would have been proud of. In London, the people continue to riot. Soldiers are desperate for orders from Creedy, but of course these orders never come. Suddenly, there is a loud sound, and a cloaked figure appears on top of a high building. The figure speaks into a microphone, and her voice is broadcast across London. She introduces herself as V, noting wryly that reports of her death were “exaggerated.” V announces that tomorrow, Downing Street—the location of the Head—will be destroyed. Henceforth, V concludes, the people of England will have to choose for themselves what kind of lives they want—lives in chains, or lives of their own. Here, it’s suggested, Evey has taken on the role of V. It’s a little mysterious that Evey can speak as V, since she’s a woman, and V is (presumably at least) a man. It’s certainly possible that V has been a woman all along (though this would contradict the evidence of Delia, Prothero, etc.). Perhaps the broader point here is that Evey’s embrace of V’s symbols has made her totally anonymous: she has no gender, no age, no sexuality—she is a symbol for the people. After giving her speech, V retreats from the roof. Inspired by V’s speech, the people of London attack the police, and a bloody fight breaks out. In the panic, a young man, apparently wounded, tries to escape from the crowd. He runs into the building where V was standing. Just as he’s about to collapse, he sees V. With this, he faints. It is November 10, 1998. At 2 pm, the “new V” (Evey) stands over V’s body. V asked for a “Viking funeral,” Evey thinks. She realizes what V meant: he wanted to be blown up in the explosion on Downing Street. Thus, she carries V into the lily train and sends the train—packed with explosives—on its path to destroy the Head (located above the area between Whitehall and St. James, exactly as V specified). Evey finally understands what V meant by a Viking funeral—a funeral in which the body is sent away (usually on a boat) and burned. This suggests that Evey has come to think like V, and, more generally, that she’s matured both mentally and physically. The “new V” leaves the train station and climbs back to the surface. After a few moments, she takes off her mask: it is Evey. Evey watches a large explosion in the distance: Downing Street is no more. One interesting question that this chapter raises is whether or not Evey has embraced V’s violent methods along with his identity. While it’s true that Evey has just blown up Downing Street, she made sure to announce the bombing in advance, making the explosion a symbolic defeat for Norsefire but giving people a chance to escape the building. It could be argued, of course, that in bombing a building Evey has decided to use violence. Moore wants us to resolve this matter for ourselves. Evey thinks to herself that the task ahead of her is phenomenally difficult, but crucial. She puts on her mask and returns to the Shadow Gallery. There she finds the young man from the riot, lying on the floor. The man awakes and asks where he is. The new V welcomes the man, and explains that they are in the Shadow Gallery—her home. Here at last, we see Evey embracing the role of V as well as the clothes and mask. She will educate her new pupil, just as the former V educated her. One fascinating possibility that this raises is that the former V wasn’t the real “man in room V” at all: perhaps he, too, was once a naïve young man (or woman) who learned to use knowledge and violence to achieve his ends. Outside London, Mr. Finch is walking on a lonely path. Suddenly, he hears a loud explosion—Downing Street has been blown up. He stares at the fiery explosion, then turns back and continues walking. In the distance, he sees a small group of people. As he gets closer, he notices that one of the group is Helen Heyer. Helen recognizes Finch, and excitedly embraces him. She explains that she’s been forced to join a group of “tramps” to survive. Helen suggests that she and Finch use their power and influence to assemble a new army and restore “order” to England. In response to Helen’s pleas, Mr. Finch gently pushes her away. Helen is furious that Finch is turning her down. She calls him “queer,” and yells that all police officers are the same—weak. Indifferent to Helen’s words, Finch lights his pipe and walks away into the distance. The final section of V for Vendetta essentially places the future of England in Eric Finch’s hands. If Finch agrees to align with Helen, they could perhaps succeed in restoring order to England and reestablishing a tyrannical regime. Yet Finch refuses to do so: he’s long since given up on the concept of authority altogether. Moore thus ends his graphic novel on a highly uncertain note. We don’t know what kind of regime, if any, will arise following the destruction of Norsefire: perhaps people will return to a democracy, or perhaps a new tyrant will emerge. One clue is that Evey is still playing the part of V: this suggests that there is still “work to be done” when it comes to anarchy and freedom. Freedom, as we’ve seen many times, isn’t simply a matter of doing as one pleases. It requires discipline, training, and hard work. Perhaps Evey will continue to be V, passing on important lessons of anarchism and freedom to others—or continue the physical fight against a new tyrant. Arn, Jackson. "V for Vendetta Book 3, Chapter 10: The Volcano." LitCharts. LitCharts LLC, 2 Dec 2015. Web. 24 Apr 2019. Arn, Jackson. "V for Vendetta Book 3, Chapter 10: The Volcano." LitCharts LLC, December 2, 2015. Retrieved April 24, 2019. https://www.litcharts.com/lit/v-for-vendetta/book-3-chapter-10-the-volcano.